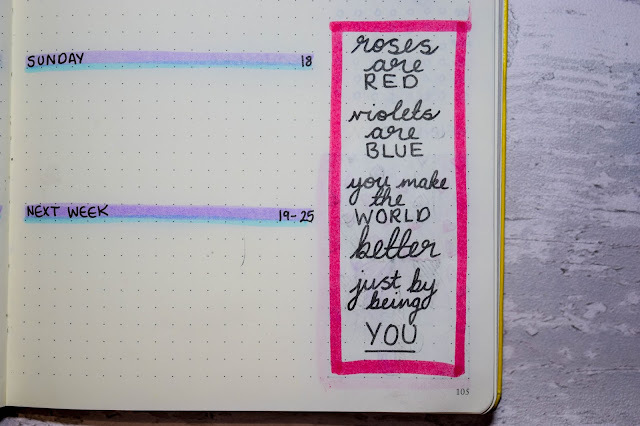 So I have a quote and a whole page to mark the beginning of the month and this month I kind of messed up my month's front page. 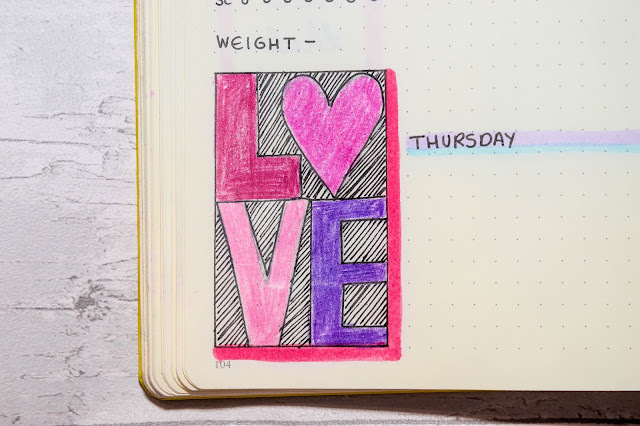 Now, I know it's not right to say I messed up because bullet journalling is all about mistakes and learning from them but it doesn't fit in with the theme and so I've only shared that page on my new Instagram account dedicated to bullet journalling and other creative outlets. 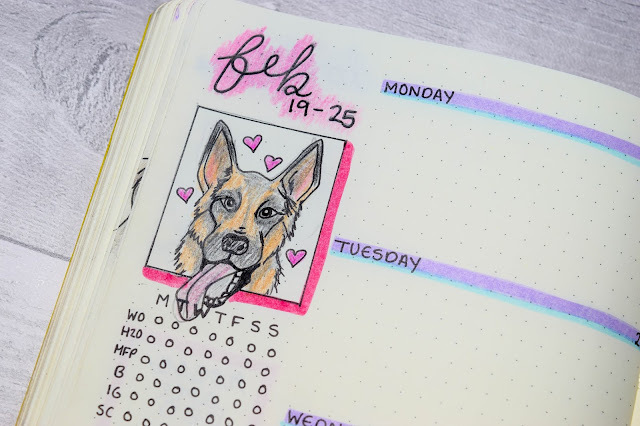 My handle is: @cat.ligraphy and please do click over to follow me there if you like bullet journalling and would like to see more creative things. 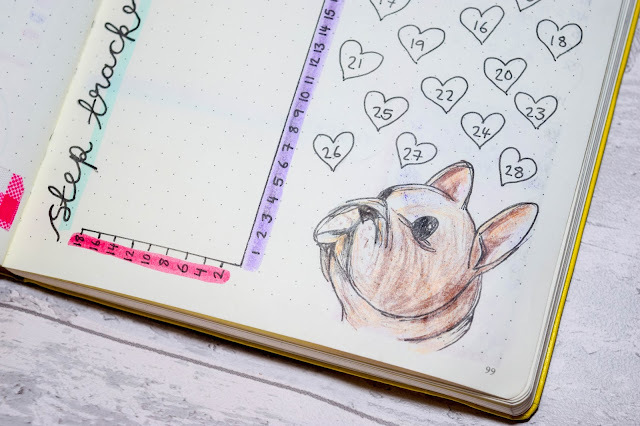 Anyway, here I have my month overview and I've decided to make it a one pager this time simply because I don't think I truly need to use all that space for the month's calendar. I already prefer it much more and feel like this is something I'm going to replicate in my March overview. 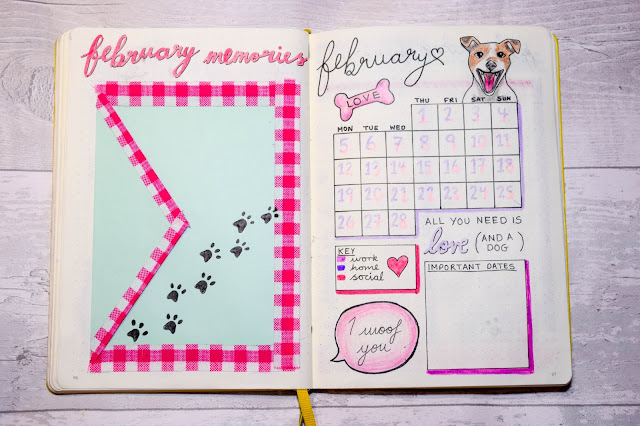 It also gave me the opportunity to use the opposite page for something I really loved using last month: the memories page. 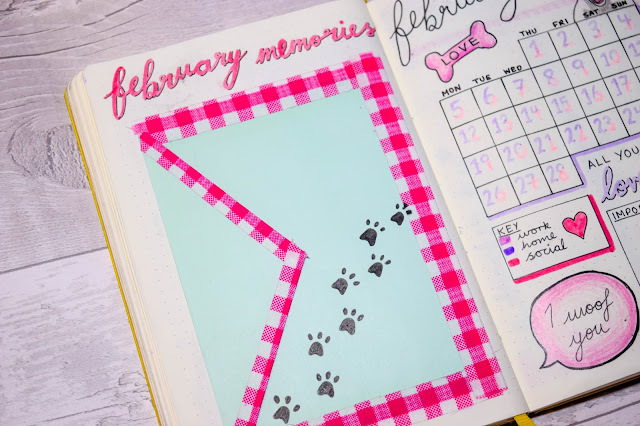 This time I thought I would have an envelope to mix things up a bit so I can fill it with photos, notes and other things to remember in February. 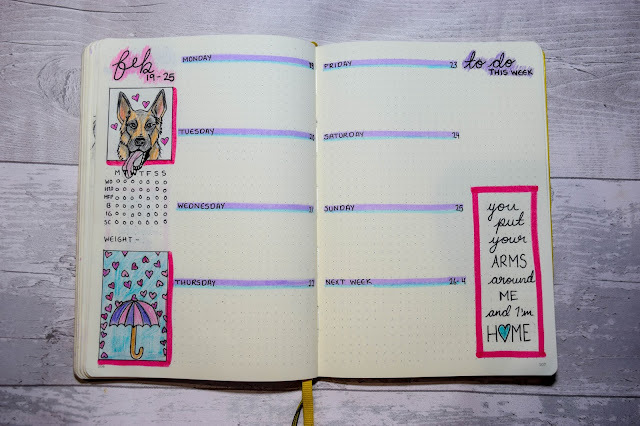 My favourite pages are the habit trackers because it's something that helps me dedicate time on my bullet journal everyday. I'm still not sure if I need a mood tracker but it is interesting to see how my month has been in regard to good days and not so good days. I think next time though I want to use more than one colour because I'm struggling to remember which pen is which. I also want to try one that colours a picture after too. I kept my steps tracker the same but I wish I did it in a bar chart form so I could see the steps from 0 to whatever I reach each day. 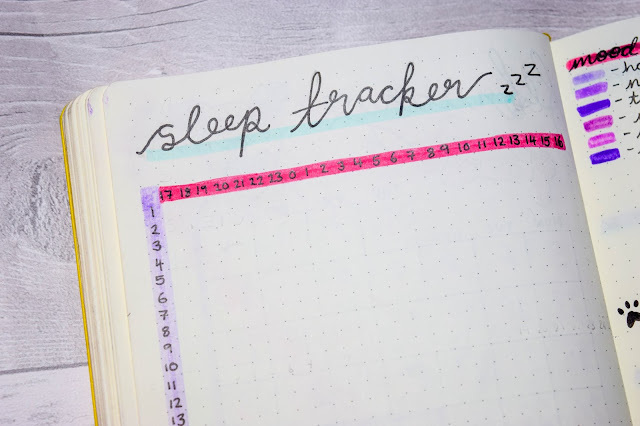 This time I thought I'd try a different sleep tracker too where I can track my sleep with the time I've gone to bed and time I got up rather than hours. I thought I'd like this but as the days have gone on, I found I'm not too fond. It also takes up quite a lot of space and so I think I'll do something different again next month. 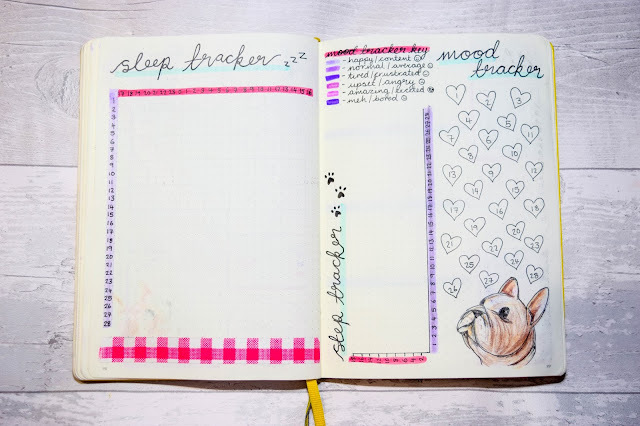 I'm still experimenting with my trackers but I like that. Once I find something I'm super happy with, I'll stick to that. 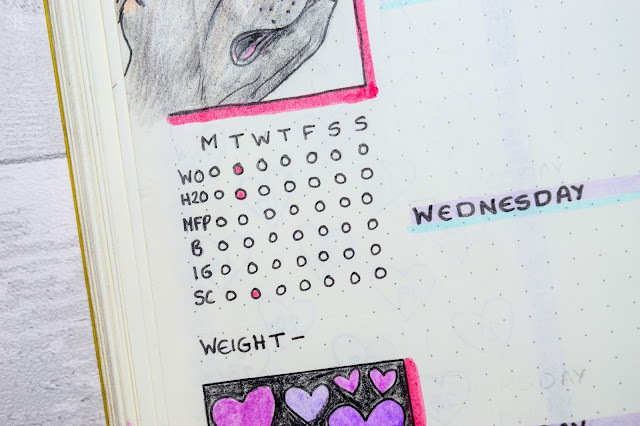 For my weekly overviews I wanted to do some weekly habit trackers and I like this a lot because it helps me keep up with what I'm doing that week. I feel this is helping me keep a closer eye on my habits and motivating me to keep going with things like working out and drinking water. 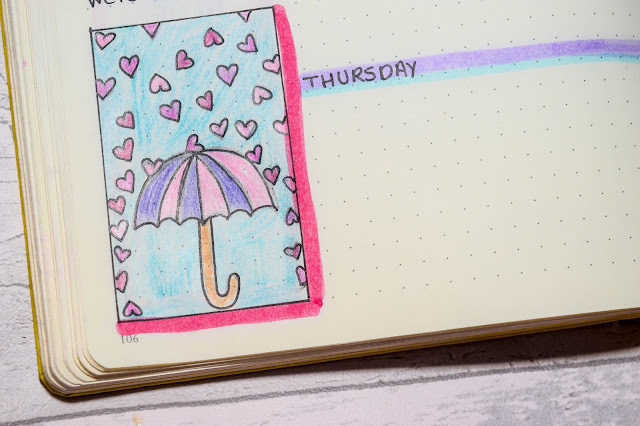 I also am trying out a new layout that not only gives me space on each day to plan my days, but another space for next week (something I find myself doing in my work diary) and a place to write a general to-do list, draw and add a quote - something I found out I like adding to each weekly overview for a couple of months now. 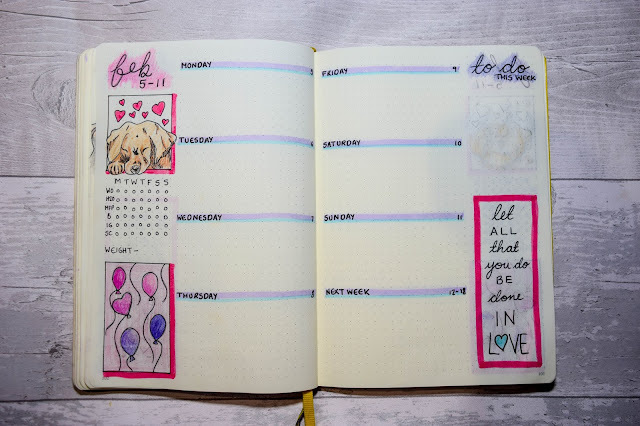 I like this layout and I'm thinking of applying it to March too. 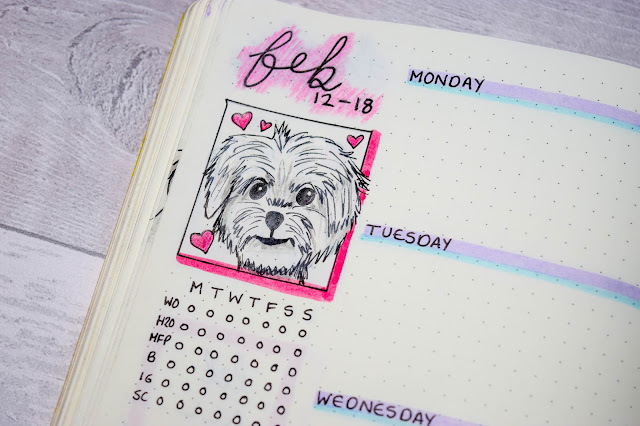 Each week has a different cute dog under the week's title. The four dogs I drew were a Staffordshire Bull Terrier, a Golden Labrador, a Maltese (puppy) and a German Sheppard. They weren't specifically chosen because I love them more than other breeds but simply because I wanted to draw a variety of dogs and explore my drawing skills and see what I could do. 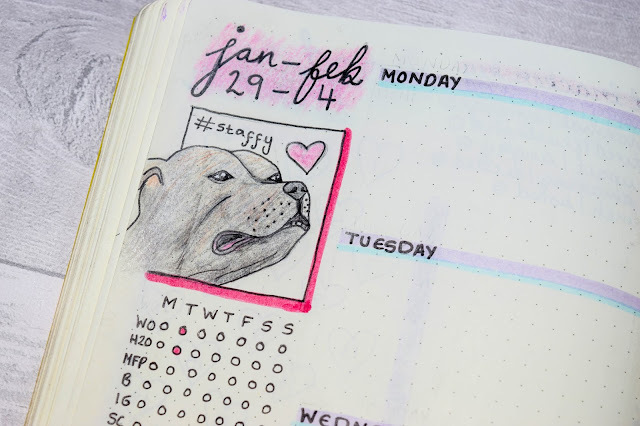 I did make sure I had a Staffy and a Jack Russell in this month somewhere (to represent my dogs) and so that's why they have a place so early on in the month. The quotes are all love related and I really like all of these ones today. I always try to make them related to me, my own experiences and also what might be happening that week or what I feel might suit that week. And to go with the quote, I've got a love-y illustration on the bottom left. It's simple but it works to keep the theme going strong throughout the month. The colours this month were purples, pink and highlights of teal. 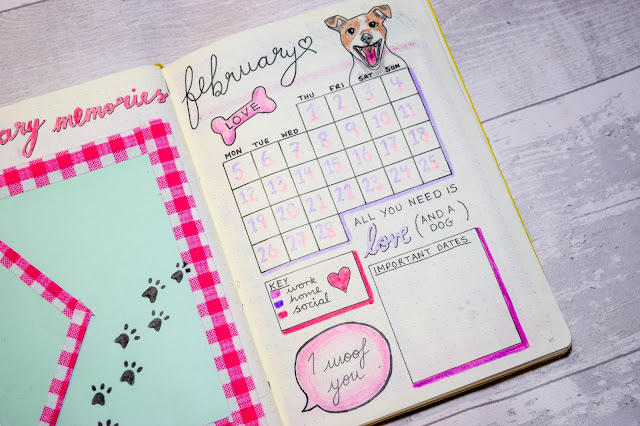 I really like how February turned out. 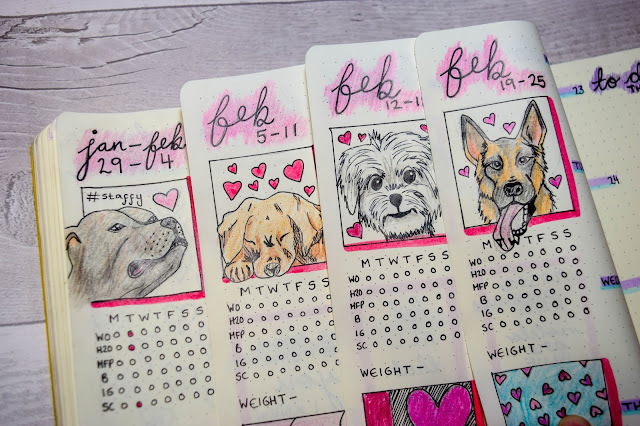 I love that I have a valentine's theme running through but that I was also able to fit the dogs in too to get that drawing element in. I've found some elements that I really liked this month that I want to use again but some that I don't too. 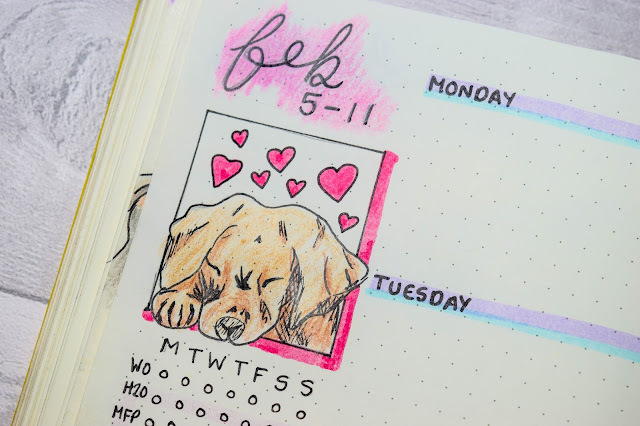 I really like the weekly overview layout and I also love my month overview. I really liked the addition of the envelope and it's inspired me (along with some 'bujo' YouTubers) to use layers and to not be scared of collaging paper and washi tapes into my journal. I also want to potentially add photos, pictures and typed quotes too. As well as making it a diary/to-do list, I want to start using it to properly record memories. 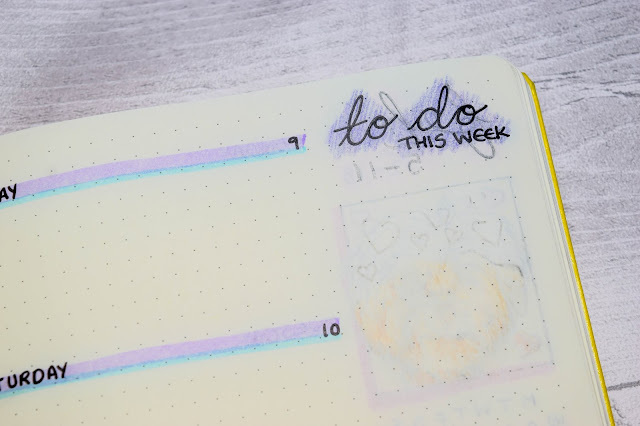 Things I won't be doing again: shades of a colour for a mood tracker (unless its dead clear), that sleep tracker and dots for my week habit tracker. 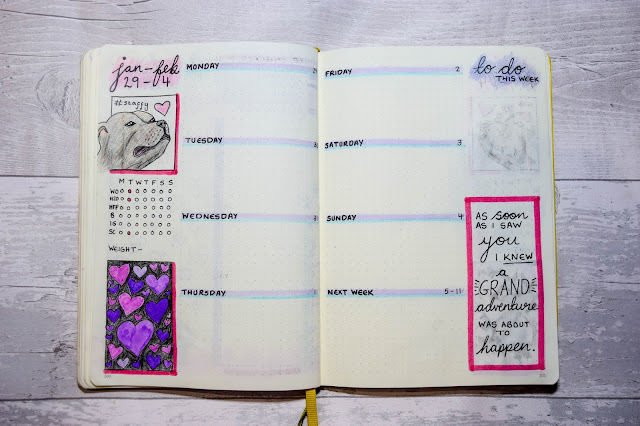 So that's my journal for this month! What do you think? Let me know and also tell me which dog you like best! Also, don't forget to go and follow BOTH of my instagram accounts: @catttsays and @cat.ligraphy! this is SO delightful to read through, you are so ridiculously creative and i love how you've set out your bullet journel. absolute goals right there, girl!!! This is such a great way to stay organised!